Before there was Martin Luther King’s “I have a dream speech” there was John F. Kennedy’s “We have a dream” address to the nation that set us on our way to reaching the moon. On May 25, 1961 before a Joint Session of Congress and just weeks after Alan Shepard’s suborbital flight, President John F. Kennedy set a course for the moon. 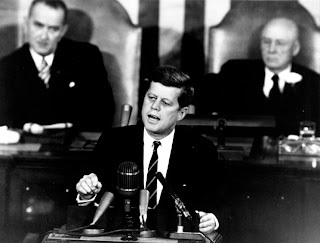 Kennedy’s speech was more direct than passionate. There was no “we should” or “we will try”, but a commitment from the President on behalf of the nation to send humans to the moon and return them safely back to the Earth. His words challenged all of us to think and dream bigger. As Kennedy made his pitch to Congress, he wasn’t speaking for some of us or to some of us, but on behalf of all of us. While his words spoke of sending “men” to the moon, they would be carried there by a country united in purpose. His challenge was not open-ended, it did not allow for compromise, obstacles, delays, or shifting political winds. It was firm and set a target date to complete the goal by the end of the decade. There was no ambiguity in the message. We would do what had not been done and reach for the stars. It sounded much like the first steps of turning science fiction into fact and the beginning of humankind’s journey other worlds. It would be the journey that would test us technically and financially, but an endeavor that generations from now would look back on much like the primitive voyage of Columbus and say that this is where the discovery of new worlds started. At the time of Kennedy’s message to the nation 50 years ago today, the United States has accumulated 15 minutes of time in space. We had yet to orbit a man in space and didn’t have a man-rated rocket capable of doing it until John Glenn’s flight, the third flight of an American astronaut. 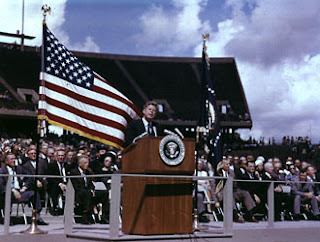 When Kennedy uttered those now famous words “I believe that this nation should commit itself to achieving the goal of landing a man on the moon and returning him safely to the Earth” his motive was to leave no doubt that the American way of life led to better technology and he wanted to showcase that to the world. The Soviet Union and the spread of communism would be no match or threat for America and space exploration would prove it. When we set out to win, we wanted to win big and the moon was the prize. A year and a half later in September, 1962 Kennedy gave a more detailed and perhaps more eloquent speech at Rice University on reaching the moon. By that time the program was underway and the course charted. In that speech he talked about costs and commitment, that reaching the moon was expensive and getting more costly by the week. He said on that day that American’s still spent more annually on tobacco products than we were spending on space exploration. JFK called space exploration and “act of faith and vision”. He tested the nation to believe that tangible results would come from developing methods, tools, and products needed to build a rocket that could carry men to the stars. He would be right. The space program of the sixties jumpstarted a technology revolution that would deliver benefits and change everyday life. As time has passed, we have learned more about the inner workings of the space race. The public face was exciting, the private side was full of questions about costs, public support, risks, and possibly partnering with the very enemy we chose to defeat. Kennedy saw that the public, even in the early days of the space program was losing interest. Even before 24/7 news, computers, and cell phones our national attention span was short and we were impatient for action and results. Eight years to get to the moon seemed a lifetime in the decade of the sixties with the Vietnam War and civil unrest. Kennedy himself privately questioned his challenge and occasionally publicly reached out with words to the Soviets about a joint effort to reach the moon. While Cold War tensions eliminated any chance that the Soviets would partner with America to reach the moon, Kennedy marched on. He remained steadfast in the face of critics who wanted him to back off the challenge. Kennedy, despite all the conflict and turmoil going on around the world remained visible and engaged with the space program. We will never know if eventually the costs of the program and the critics would have persuaded Kennedy to soften his position. His death by an assassin only served to assure that no effort would be spared to achieve his goal. Fifty years later as we end another chapter in the history of the space program we wonder when humans will once again set foot on another celestial body. As decade after decade passes, stretching our technology and testing our national resolve on a Kennedy-like challenge for space seems further away. One cannot help but look back at a time when through the questions about why we should explore space and how much it would cost, one man’s voice stood above the rest and dared to take us to new heights. Even though Kennedy may have questioned his own rationale for space exploration in private, he ultimately knew it was the right thing to do for the country and to advance our society. Ironically, it would be his death more than his life that would take America through its “Golden Age of Human Space Exploration”. Though some have tried, no President since JFK has moved a nation and the Congress to action in space exploration in the way that he did. That period of history may never be replicated with the same intensity and desire, and for that we remember a time when we reached for the stars and landed on the moon.